This is Zai’s first solo exhibition in a commercial gallery, and marks his relationship with Ota Fine Arts. The new body of work is informed by his ongoing research on the Orang Laut — “sea gypsies” or nomadic indigenous fishermen living in the Riau Archipelago — and the survivors of the massive earthquake, tsunami and Fukushima-Daiichi nuclear disaster of 2011.Kuning comments on how these groups have been dictated by external circumstances beyond their control, have lost their homes, and are in search of a place of rest where they can rebuild their lives. His work has come to reflect upon issues of displacement and rupture. 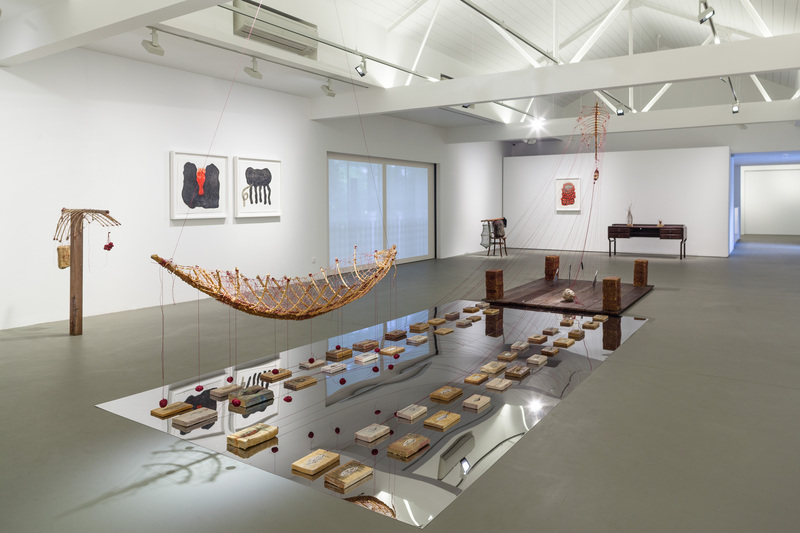 The centrepiece, The Fleeting World of Dapunta Hyang, is the first of a series of artwork based on ancient Malay history from the 7th century. Click here for more images of the works. For Singapore Biennale, Zai proposed a project to ‘free’ The Substation’s garden. The Substation is Singapore’s first independent art space and its garden was opened for artists to use. Many pioneering indie, rock, metal and punk bands began their roots playing in the garden, and so did dramatised readings, performance art, and various forms of art experimentations. However, in 2005, the garden was taken over by Timbre, a live music bar, and catered only for paying customers. Zai proposed to free the garden for the artistic community to use again over the Biennale two-month period; Timbre quoted a compensation of S$1-million. The project fell through due to lack of fund and an exhibition detailing the negotiations was shown in The Substation gallery during the time of the Biennale. In 2006, Zai proposed a project ‘Talk to him’ to show an unedited film whereby key members of the intellectual community are asked to speak to the camera directly to then senior minister Lee Kuan Yew. However, due to the biennale not wanting to undertake legal responsibilities of the work, the project failed to execute as well. A Bowl of Rice was commissioned by The Sculpture Square for their 9th Anniversary celebrations in June 2008. Over three weeks, Zai created three geometric rice installations that occupy the entire floor space of the 195 sqm chapel gallery, using 500 kg of rice bought and another 500kg donated by the public. 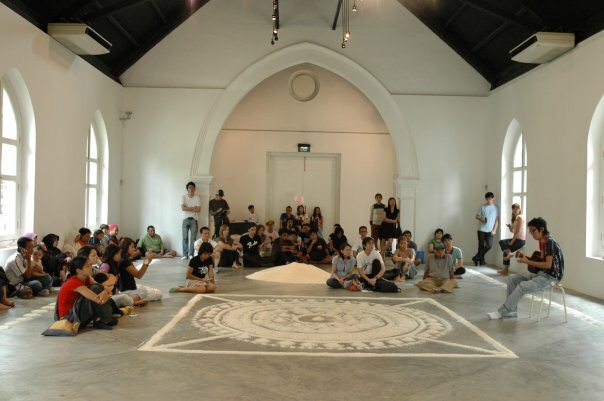 With the erasure of each installation at the end of each week, the rice was donated to charity organisations such as H.O.M.E, which shelters abused female migrant workers and Singapore Kampung Senang Charity & Education Foundation.This work was a socioeconomic response to the increasing costs of materials. Click here for more images of the work.